In this post we will see how to set up our game world. 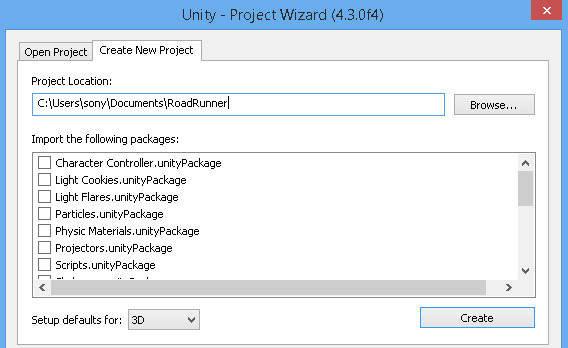 Open Unity3d, click on Create New Project tab of the Project Wizard window. Select the path where you want to save this project and give it a name, I've named mine as RoadRunner. Keep the rest of the options as they are. Once done, click on Create. You'll be greeted by a dialog box, close it once you accept the greeting and feel blessed. Well, you have no option other than to close it even if you don't feel anything, unless you love to be disturbed by the dialog box. Go to File-> Save Scene and save your scene. Name it anything, I named mine as game. Add a Directional Light to you scene by navigating to GameObject-> Create Other. Add a Cube to your scene by navigating to GameObject-> Create Other. Rename it as Ground in the inspector panel. Position the Ground at (0, 0, 15). Change the scale to (10, 0.5, 50). Add another cube in the same manner. Rename it as Wall. Position it at (5.5, 0.7, 15.5). Change the Rotation field of the Wall to (0, 0, 90). Scale it to (5, 1, 50). Duplicate the Wall by right clicking on the Wall gameobject in the Hierarchy panel. Position it at (-5.5, 0.7, 15.5). Change the Rotation field of the this Wall to (0, 0, 270). Your scene might already have a Main Camera. Position this camera at (0, 3, -10). Change the Rotation of the camera to (25, 0, 0). This is it for this post. In the further posts we will see how we can build up on this start.